Shakespeare Style PL-258-CP-G gold-plated The perfect solution to the troublesome task of installing a PL-259 connector or splicing RG-58 A/U, RG-8/X or Lo-Max coaxial cables. Shakespeares revolutionary Centerpin connectors are solderless, fret-less, and botchless. They go on without a hitch, without soldering skills. No measuring, no critical stripping of coax insulation, no fussing with the coaxs braid, and no tinning. For RG-8X or RG-58/AU coax Barrel connector for PL-259-ended cables Join two cables together - in a snap! 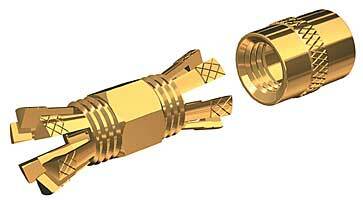 Gold-plated brass to better withstand the elements and to minimize traditional connector-borne signal loss. The perfect solution to the troublesome task of installing a PL-259 connector or splicing RG-58 A/U, RG-8/X or Lo-Max coaxial cables. Shakespeares revolutionary Centerpin connectors are solderless, fret-less, and botchless. They go on without a hitch, without soldering skills. No measuring, no critical stripping of coax insulation, no fussing with the coaxs braid, and no tinning.